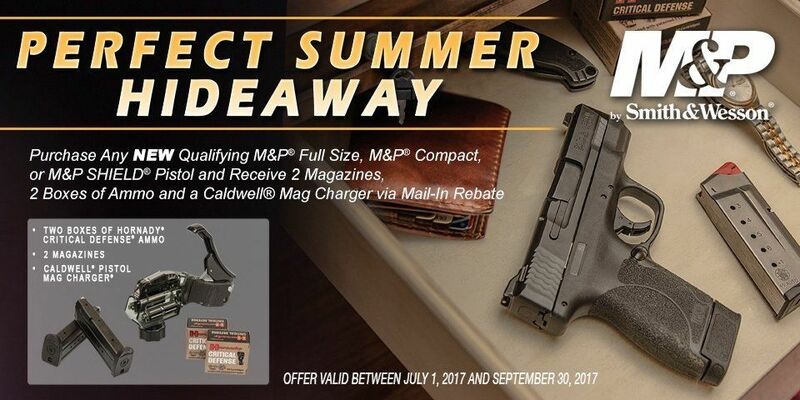 Purchase any NEW qualifying* M&P® Full Size, M&P® Compact, or M&P SHIELD® Pistol and get 2 magazines, 2 boxes of ammo and a mag charger. Excludes .22 LR models. * Centerfire M&P® full size pistol, M&P® compact pistol or M&P SHIELD® pistol. For more details go to https://www.smith-wesson.com/mp-rebate-v2. Fill out the rebate submission online. Note that this rebate is filled by Smith & Wesson and not OCG.